As I have probably mentioned before in previous articles, I live in Japan. I am originally from America, but came to Japan to work as an assistant English teacher. Living in Japan has been great, and I truly enjoy it here, but I would be lying if I said there weren’t downsides to being one of the few people of your race in your work-space and general community. Japan is a largely homogeneous country with roughly 98.5% of its citizens being ethnically Japanese. This number though is only an estimate as Japan has no formal census on its ethnic demographics and the government conflates nationality with ethnicity. Like with most countries that have a minority group, a certain amount of racism can be expected. Racism in Japan isn’t always very apparent, especially since Japan is a relatively peaceful country. But racism appears in Japan in quieter, more sinister ways such as childhood bullying, housing discrimination, and an air of pandering politeness that masks a lack of respect and understanding of culture. This “diet racism” seen in Japan can come across in its media in the form of reoccurring character tropes, which further reinforce stereotypes. In animation in particular, such “token” characters become a lot more apparent since animated characters are a lot easier to manipulate in both personality and appearance, leading to a greater possibility of the creation of racist caricatures. Japan, of course, isn’t the only country to use “token” characters since racism in some form can be found all over the globe. There are obvious parallels between token characters in anime and token characters in American entertainment media. However, I feel that this part of anime is often overlooked, and as a foreigner living in Japan, I wanted to address certain trends in the portrayal of non-Japanese characters in anime – characters that I like to call “the token foreigner”. For the next few articles, my goal is to take a look at some prominent examples of foreign characters appearing in Japanese animation. I want to define what makes a character “token”, show examples of said character type, explain how and why they are used, and try to find some examples that do a respectful job of portraying such a character. My main rules for what anime I look at are that the series must take place primarily in Japan and the setting must be “this” world; which means no fantasy worlds like Fullmetal Alchemist. Additionally, there can be no huge shifts in the status quo like in Code Geass where the borders of countries are split along the lines of fictional conquering powers and Japan has ceased to be an autonomous country. Other versions of our world or futuristic societies are allowed as long as the general “borders” of current world countries are maintained (or current as of the making of said anime). I’m also not including anime where the setting is ambiguous (like Tiger and Bunny) or if the purpose of said anime is to poke fun at stereotypes (like Axis Powers Hetalia) . Finally, before anyone starts furiously slamming on your keyboards, please note that I do not hate anime or any of the particular anime in these articles (in fact I enjoy many of them). This is simply an aspect of anime that I have noticed; one which I believe can be improved on and that future creators can learn from. My purpose is to raise awareness, not to point fingers. So without further ado, let us move onto what makes a “token foreigner”. Token foreigners in anime are primarily there for two reasons – for comic relief or to add some exotic flare to the cast. Token foreigners are often portrayed as humorous, loud, wacky, or otherwise abnormal. You’ve got the Columbian, Pedro from Excel Saga who is clueless, constantly lost, and usually just there for a punchline. There’s the Italian, Parco Folgore, from Zatch Bell, who is a self-centered, womanizing narcissist whose showboating provides the series with comic relief. I find him by far one of the most obnoxious characters I’ve seen in anime, mostly because he has his own theme song that is all about grabbing women’s breasts. Not exactly the most flattering image of a foreigner. The sixth episode of Samurai Champloo is rather infamous for its odd portrayal of a Dutch man named Isaac. The episode itself is relatively decent, but the character’s design is very strange in comparison to the other characters, and his speech (in Japanese) is heavily accented . The reason for the common foreign-character-equals-weirdo trope most likely comes from differences in culture, speech, or humor getting lost in translation if and when Japanese people interact with foreigners. It possibly also stems from how Japanese people see foreign film or comedy, which has a distinctly different style to Japanese entertainment media. The portrayal of such foreign characters in anime, both helps create and confirm the wacky foreigner stereotype. Though his episode is written well enough, Isaac’s (left) character design is decidedly much stranger, more angular, and made to look less appealing than Samurai Champloo‘s main cast (right). But what if an anime’s foreign character is not particularly strange or wacky? Well, that’s okay because they can still be used for comedy through goofy and awkward interactions as a result of said foreign character’s lack of knowledge of Japanese culture and social cues. Even if a character is not particularly strange, they often add awkwardness or comedy to the situation while being ignorant to the awkwardness they create. One example of this is scenes including the American-Russian character, Simon, from Durarara. He is portrayed as rather boisterous and it is apparent in his introduction scene that some people are awkward or nervous around him. For humor involving cultural misunderstandings, look at Patricia, an American, from the comedy series, Lucky Star. Like most characters in the show, she is a huge anime fan, but only knows things about Japan through the lens of anime, thus having a weird outlook on Japanese culture in the eyes of the other characters. Another common comedic staple in anime is to create foreign characters with an obvious foreign accent . Random use of English (and in rarer cases other languages) is also very usual for foreign characters, even when (and sometimes especially when) it doesn’t make any sense. The sole purpose of the character TK from Angel Beats seems to be spouting out random English phrases. The dude literally never gets any other speaking lines. These interactions focus on the foreign character’s lack of understanding of the Japanese language or culture, but never really push for the Japanese characters or for its Japanese audience to try to understand the foreign character themselves. Instead it solidifies in the viewer’s mind that trying to talk with a foreign person may be too hard or too awkward and displays it as a matter of “this is just how things are”, rather than trying to push for better communication . This is a reflection of how many Japanese people feel when they are forced to interact with foreign people in real life. Rarely do Japanese people in Japan have a chance to interact with foreigners or with anyone outside their own race . Due the fact that many Japanese people cannot speak English well, and due to the assumption that anyone who looks foreign can only speak English, it can be very nerve-wracking for a Japanese person to talk to a foreigner . Obviously these common assumptions on the Japanese person’s part are wrong since 1.) just because a person is foreign doesn’t mean that they don’t speak Japanese 2.) just because a person is foreign doesn’t mean that they do speak English and 3.) just because a person looks foreign doesn’t mean that they are not from Japan. I have actually seen this last issue addressed a couple times, once in a comedy sketch , and another in a short scene from the anime, Chihayafuru. It is nice to see these assumptions challenged, but it’d be better if anime would do so outside of one or two random gags with characters that we will never see again. Silly characters aside, the token foreigner has another use in anime – the antagonist. If you want to make a villain more villainous and the protagonist more likable, just make your antagonist less relatable. And what better way to do that than to put them in a different ethnic group or different nationality than you? I think the most glaring example of this is in YuGiOh, as most of its villains are not Japanese while the main characters are. You’ve got minor antagonist Bandit Keith, who literally wears a bandana with the US flag on it. He is so obviously an American stereotype that he has become a punchline in the spoof “The Abridged Series“. The first arc’s villain, Pegasus, is also American, while the second arc’s villain, Marik is Egyptian. One could argue that the spirit inhabiting Yugi is Egyptian as well, but he is given a decidedly lighter skin tone and made to look Japanese, because we can’t have our main character looking foreign. Both are technically Egyptian, but you’re supposed to like only one of them (hint: it’s the guy with lighter skin). Samurai Champloo appears on this list again, this time with an episode surrounding a baseball game against invading American forces. It is a very obvious reference to Matthew Perry forcing Japan to open its borders at the end of the Edo period of Japan (which admittedly is probably an appropriate time to make the foreigner the bad guy). The Americans, like Isaac, look very strange and swear in English a lot. The episode does have a humorous spin, and I give it points for using what seem to be fluent English speakers to voice a few of the English lines, but it’s another example of Japanese equals normal/good, and foreign equals weird/bad. The foreign character doesn’t necessarily have to be a villain, but can be combative or an obstacle for the main characters to overcome. Asuka, from Neon Genesis Evangelion, is from Germany and acts very abrasively to the other characters. She is brash and loud, and even makes a reference at Japanese people being too soft and indirect. She is a protagonist, but she doesn’t play nice with the other protagonists for much of the series. Same goes for Jung, a girl from the Soviet Union in the series Gunbuster (the anime was made in the 80s). She later becomes friends with the series’ protagonists, but her first scene on screen involves her directly picking a fight with them. 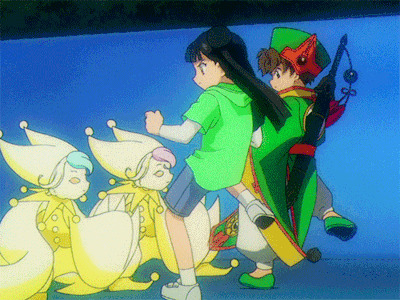 Some foreign characters also act as rivals to the main characters, such as Shaoran Li, a boy from Hong Kong, in the anime Cardcaptor Sakura. The show’s two other foreign characters Mei Lin (also from Hong Kong) and Eriol (from England) play similarly antagonistic roles. And even though all three either become friends with the heroes or are otherwise written well and sympathetically, their first impressions aren’t the greatest. Also, all people from Hong Kong know martial arts, right? The most common genre to use the foreign rival trope is in sports anime, where said opponent seems to be disproportionally black. The reasons behind this are probably as bad as you think. But we will get to this side of the token foreigner in the next part of this series of articles: “Sports Anime and the Portrayal of Black Characters”. If there are any other anime that I did not mention in these articles, it is likely that I was not aware or familiar enough with them to be able to make commentary on them. So please, no questions along the lines of “why didn’t you include this anime”? However, if there are any anime with interesting portrayals of foreign characters, I’d love to learn about them. Informed responses to these articles are welcome, since I like to learn, too. Note that I watch most of my anime in the original Japanese language. Hence I am aware when a foreign accent is being used in Japanese. Characters with heavy accents in anime often leave me wondering if that’s what other people think I sound like when I speak Japanese. The thought terrifies and embarrasses me a little. Which is really frustrating when you are an English teacher and it is your job to encourage students to communicate in another language. In most cases, with most Japanese people I meet, I am the first non-Japanese person they’ve ever talked to. I get the deer-in-the-headlights look a lot when I try to talk to new people in Japan; even if I speak to them in Japanese. This comedy sketch is certainly exaggerated, but not by much. If I’m with Japanese friends, or people who look more Japanese than me, it is common for others to address them, not me. This was super interesting to read, even as someone who doesn’t consume very much anime. Looking forward to the next part! Do you have any plans to contrast token foreigners as they’re portrayed in anime compared to American animation? Could be interesting, but I imagine you’ve got a lot planned for this already. Truthfully, I’m actually not that interested in looking at “token” characters in American animation, simply because it’s been talked about before. I haven’t seen anyone explore “token” characters in Japanese animation to the same extent, and while researching these articles I was surprised to find very little information, if any. There have certainly been those “is anime racist?” talks out there, but I feel like they tend to be less nuanced and don’t understand that there can be a spectrum to things. So I picked out specifically “token” characters because I find them an interesting facet of how a country views people of other races/backgrounds – especially since a majority of the time the harm that they can cause is not deliberate or willful, and even can come from a desire to be “inclusive”.